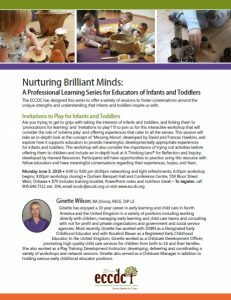 We would like to invite educators who work directly with Infants/Toddlers, Preschoolers or School Agers to attend our newly formed, age group specific network meetings. 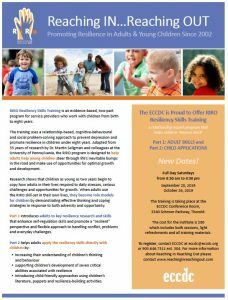 Based on feedback from the early learning community, ECCDC would like to start offering age specific networking groups. What does it mean to inquire? Grownups would say it means to question, to search for information, or to finding out about a topic of interest. For children in an early childhood classroom, the definition is no different. From the time of their birth, children want to know how the world works and actively seek out information. How educators respond to their questions is what this book is all about. On October 17, 2018 the recreational use of marijuana became legal in Canada. 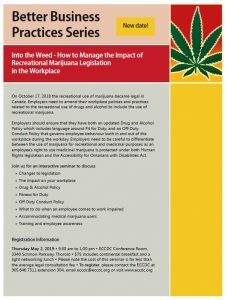 Employers need to amend their workplace policies and practices related to the recreational use of drugs and alcohol to include the use of recreational marijuana. There’s more to water play than floating and sinking! 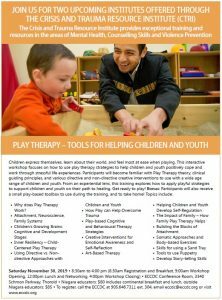 Find out why one of the best resources in an early learning and child care setting is a tap. 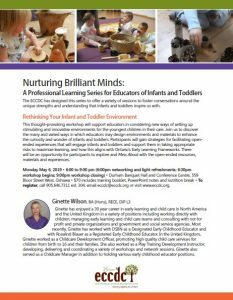 Part of Nurturing Brilliant Minds - a Professional Learning Series for Educators of Infants and Toddlers. 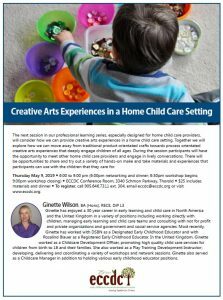 This thought-provoking workshop will support educators in considering new ways of setting up stimulating and innovative environments for the youngest children in their care. 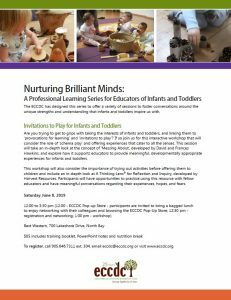 Join us to discover the many and varied ways in which educators may design environments and materials to enhance the curiosity and wonder of infants and toddlers. Part of the Speaking the Languages of School Age Children Series. 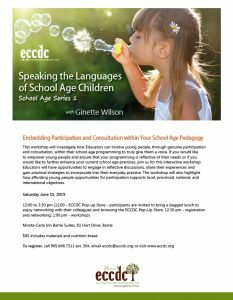 This workshop will investigate how Educators can involve young people, through genuine participation and consultation, within their school age programming to truly give them a voice. 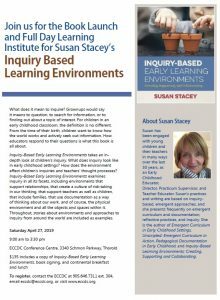 In this interactive session, we will explore how a Read Aloud can be used to spark children’s innate curiosity and inquiry in our youngest learners. From STEAM (Science, Technology, Engineering, Arts, Mathematics) challenges to culturally diverse literature, participants will walk away with ideas and resources that they can implement immediately in their early learning environment. 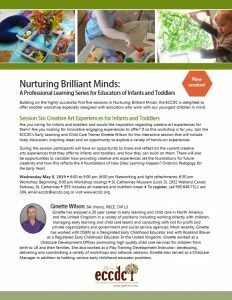 Niagara’s Early Learning Supervisors are invited to tour Strive Welland Parent Child Care Centre where they support young parents embarking on their journey in becoming parents. During the evening the Supervisors will have an opportunity to engage in conversation as well as receiving updates from Ministry of Education, Niagara Region Children’s Services, Niagara Region Public Health, and Quality Child Care Niagara. A supervisor focused reflective article will be reviewed and discussed along with round table ideas. 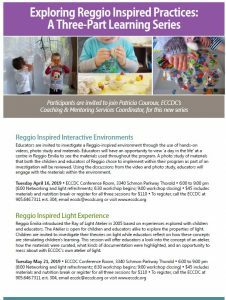 Reggio Emilia introduced the Ray of Light Atelier in 2005 based on experiences explored with children and educators. The Atelier is open for children and educators alike to explore the properties of light. Children are invited to investigate their theories on light while educators reflect on how these concepts are stimulating children’s learning. 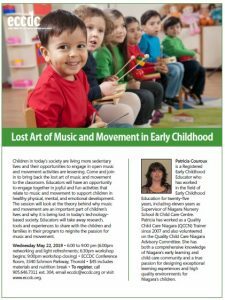 Children in today’s society are living more sedentary lives and their opportunities to engage in open music and movement activities are lessening. Come and join in to bring back the lost art of music and movement to the classroom. 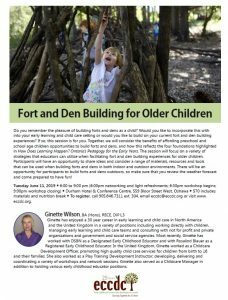 Do you remember the pleasure of building forts and dens as a child? 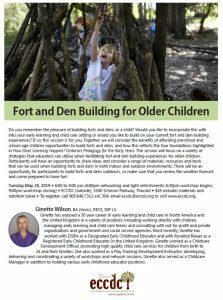 Would you like to incorporate this with into your early learning and child care setting or would you like to build on your current fort and den building experiences? As Educators we are becoming more and more aware of the need for children to take healthy risks and the benefits that go with healthy risk-taking that challenges children. 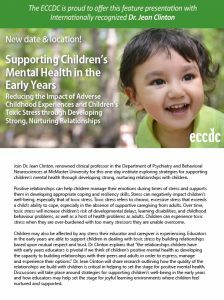 But what does this look like for infants and toddlers and how do we provide experiences that afford risk and challenge for younger children? The Niagara Nature Alliance network will be touring the Fort Erie Regional Child Care Centre naturalized playground. 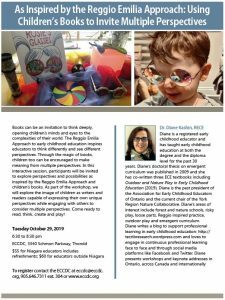 Fort Erie Regional Child Care Centre was part of the Naturalized Playground Initiative children, families and educators in nature here in Niagara. As a next step the network will also be reviewing the hot-dotting exercise from the Fall meeting to move the network forward. A review of currently available websites and documents to support educators in their move to a nature-based program, conversation around the message of what the Nature Alliance is all about and sharing of resources from programs. 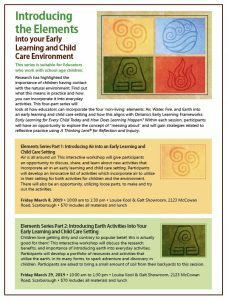 The fourth and final thought-provoking session of this series will include discussing the research regarding the benefits of utilizing fire, in its various forms, in an early learning and child care setting and what this means in practice. 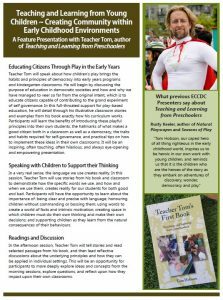 Are you trying to get to grips with taking the interests of children, particularly infants and toddlers, and linking them to ‘provocations for learning’ and ‘invitations to play’? Adults assume that young people are naturally active; however, current research is indicating that this is not always the case as they are now engaging in high levels of sedentary behaviours and low levels of physical activity. 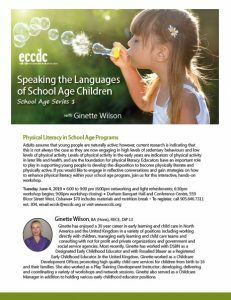 Levels of physical activity in the early years are indicators of physical activity in later life and health, and are the foundation for physical literacy. 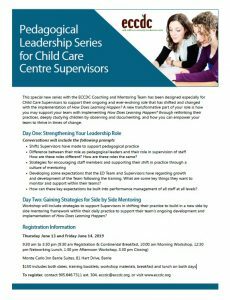 This special new series with the ECCDC Coaching and Mentoring Team has been designed especially for Child Care Supervisors to support their ongoing and ever-evolving role that has shifted and changed with the implementation of How Does Learning Happen? 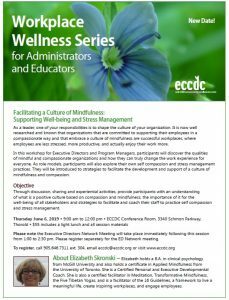 Executive Directors are invited to attend this network to connect about issues and opportunities to share strategies, suggestions and best practices with their colleagues. Are you trying to come to grips with the move towards creative arts and away from traditional crafts? 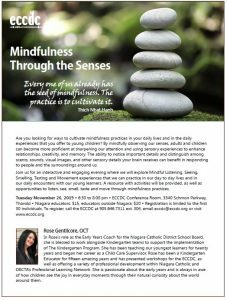 If so, join us for this hands-on, interactive workshop. 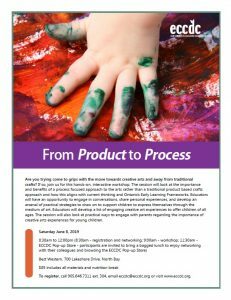 The session will look at the importance and benefits of a process focused approach to the arts rather than a traditional product based crafts approach and how this aligns with current thinking and Ontario’s Early Learning Frameworks. Do you ever wonder about children’s repeated patterns of behavior? Why they do things over and over again? Why children play longer with a box rather than the toy that was in the box? Or why toddlers love to hide behind the coats in the cubby area? Or why a child completely covers over the painting they have spent ages creating? Are you trying to get to grips with taking the interests of children, particularly infants and toddlers, and linking them to ‘provocations for learning’ and ‘invitations to play’? If so, join the ECCDC’s Early Learning and Child Care Program Consultant, Ginette Wilson, for this interactive workshop that will consider the role of ‘schema play’ and offering experiences that cater to all the senses. Educators within Reggio Emilia reflect on their planning and documentation with several different lenses. 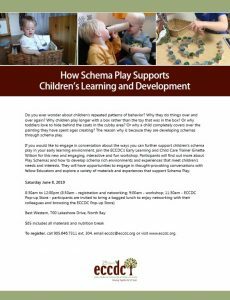 The use of planning and documentation shows children and families a shared construction of meaning within the environment, a shared responsibility towards learning, offers an evaluation of both the environment and self. This session is part of the ECCDC's 25th Anniversary Workshop Series. This lively workshop will highlight 5 key board principles and 5 related practices to help boost your board’s effectiveness, engagement and enjoyment. A variety of tools and resources will be shared. In celebration of ECCDC’s 25th Anniversary, participants will receive a link to the Principles and Practices Checklist© to help your board assess their governance strengths and challenges. 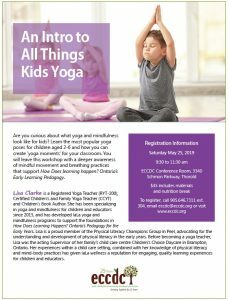 Complimentary Workshop thanks to Gay Douglas’ sponsorship in honour of ECCDC’s 25th Anniversary! Over the next 5 years Canadians will be retiring at a pace unparalleled in human history. The biggest demographic wave in the country’s history is hurtling into retirement. The baby boomers – that massive bubble of people born in the two decades following the Second World War - have begun the transition from employment to retirement. Books can be an invitation to think deeply, opening children’s minds and eyes to the complexities of their world. The Reggio Emilia Approach to early childhood education inspires educators to think differently and see different perspectives. Documentation practices in early education typically focus on children’s learning; educators are present in documentation only as observers – whether enthusiastic or neutral, their role in documentation is to report on what children have done, and said, and accomplished.